Peter Jackson’s adaptation of The Lord of the Rings had him team up with storyboard artist Christian Rivers to storyboard the series. The process began in August of 1997. He also got Richard Taylor of Weta Workshop to begin creating an interpretation of Middle-earth. To this end, he told them to think of Middle-earth in a historical manner – as though it were a real world. Also helping the project as the trilogy’s primary conceptual designers were Alan Lee and John Howe, both of whom had experience as illustrators for the novel and other tie-in works. Filming took place in New Zealand because the grassy fields that stretch to the foothills of the mountains exactly matched how Middle-earth was described in the novel. The Fellowship of the Ring cost over $90 million USD to shoot. Fortunately, it was a complete success in the box office, generating roughly $870 million in the box office. It wasn’t just a hit with those who enjoyed the novel, however; critics considered it one of the best films of 2001. Though certain fans expressed their skepticism before the film was released, they too were, for the most part won over by Mr. Jackson’s interpretation. As soon as the film begins, you will realize just how beautifully shot it is. Even in the prologue, which depicts the historical battle of Middle-earth is brimming with color and life. The opening sequences do a superb job setting up all the major pieces before the story truly begins. In a way, it seems like this trilogy’s take on the opening text crawl famously featured in the Star Wars franchise. Though doubtlessly iconic itself, the prologue of The Fellowship of the Ring is much more sophisticated in this regard, for the backstory is accompanied with visuals instead of being superimposed upon a static background. This is all punctuated with Cate Blanchett’s perfectly delivered narration. The introduction of one’s film is something that is often difficult to get just right. If you throw too much at the viewer at once, you might end up spending the rest of your film trying to top the high point established in the opening. On the other hand, if you draw things out for too long, you run the risk of losing your audience’s attention. The Fellowship of the Ring reaches a compromise in that the opening draws you in, yet you’re not actively wishing for the action to pick up when it winds down. This is where we are properly introduced to the cast. Frodo Baggins is played Elijah Wood, who was a fan of the novel. He got the part after sending in an audition tape dressed as Frodo and read lines from the novel. One-hundred-and-fifty actors auditioned for the role, including Jake Gyllenhaal. Casting the other roles proved to be an interesting process, as many prominent actors were sought out, yet many of them had little faith in the story. In the role of Gandalf, Middle-earth’s premier wizard, is Ian McKellen. Sean Connery was originally approached for the role, and he famously turned it down due to not understanding the plot. Similarly, Patrick Stewart declined, disliking the script. This gave Ian McKellen the opportunity of a lifetime, though it proved somewhat arduous as there was a two-month overlap with 20th Century Fox for the production of X-Men, in which the esteemed actor portrayed Magneto. Perhaps the most interesting story involves the casting of Aragorn, the descendant of Isildur and heir to Gondor’s throne. Daniel Day-Lewis was offered the part during pre-production, but he declined. Nicolas Cage was also approached, but he too turned it down, citing family obligations. Vin Diesel auditioned for the role having been a fan of the novel, but did not make the cut while Stuart Townsend was initially cast before Mr. Jackson deemed him too young. The team considered Russel Crowe as a replacement before he too declined, believing it to be a similar role to Gladiator. Finally, Executive Producer Mark Ordesky found a promising actor in a play he watched. The son of this actor, himself a fan of the novel, convinced his father to take the role. The actor, Viggo Mortensen, read the book on the plane heading for New Zealand whereupon he received quick lessons in fencing. He became very popular among the crew by patching up his costume and carrying his sword with him off-camera. Live-action fantasy films tend to be difficult to film. It is likely not a coincidence that some of the earliest attempts at adapting The Lord of the Rings were animated. This was exemplified when United Artists, who had purchased the film rights in 1969, approached Stanley Kubrick to direct an adaptation. Though Mr. Kubrick considered the offer, he ultimately turned it down, feeling the novel couldn’t be filmed due to its immensity. The problem is that the very idea is something of a paradox. As with every genre, the director needs their actor to turn in believable performances, which would seem impossible in light of the abundance of fantastical elements. If one is to shoot a live-action film with a mundane premise, there is a long, unspoken list of dos and don’ts. Experimental directors will play with these expectations for good or for ill, but otherwise, it’s easy to tell, given their abundance, what does and doesn’t work. This isn’t even getting into the large casts fantasy epics tend to boast, meaning those who are seriously considering making one will need a master editor to have any chance of success. My point by establishing all of this is that even as late as 2001, Peter Jackson was exploring largely uncharted territory. Fantasy films beloved by fans and critics alike were exceptionally rare – one of the very few examples being the original Star Wars trilogy. It was therefore easy for his vision of The Lord of the Rings to turn out like Star Wars merely translated from a futuristic setting to a medieval one. Fortunately, I can say that Mr. Jackson passed these tests with flying colors. Frodo Baggins is quite a bit different from a typical fantasy story protagonist in that he isn’t an action hero, instead getting by through a combination of wits and luck. Nonetheless, he does prove very resourceful, and does eventually gain the spirit of an adventurer as time goes on – just like his uncle. Elijah Wood was a great choice to play this everyman who suddenly has the fate of the world resting on his shoulders. Then, of course, there’s Ian McKellen’s unforgettable portrayal as Gandalf. Many people liken him to Merlin from Arthurian legend, which is highly fitting. He is a powerful wizard who takes his duties seriously, yet has a whimsical side to him, as evidenced when he celebrates Bilbo’s birthday by bringing a cache of fireworks he made himself. Though The Fellowship of the Ring has an identity distinct from that of Star Wars, they are decidedly similar in tone. They are fairly serious for the most part, imploring its protagonists take action lest they see the world reduced to cinders. At the same time, it’s not all doom and gloom, for there are plenty of humorous moments to lighten up the proceedings. The key is that the comedic moments do not ultimately subsume everything else; the story knows when it’s time to put on a serious face. If an antagonist is onscreen, you can expect any banter the protagonists may have been engaging in beforehand to stop instantly. Interestingly, Christopher Lee expressed interest in playing Gandalf. However, the casting directors felt he was too old for the part. As a consolation prize, he got to play the evil wizard Saruman instead. With Sauron being largely predisposed, Saruman is the acting antagonist of this story. It’s common in many fantasy stories for antagonists to, metaphorically or literally, sit on their thrones all day, waiting for the heroes to kill him. What The Fellowship of the Ring does is go out of its way to justify why Saruman doesn’t simply hunt down the heroes personally. It’s because he is in the process of amassing an army of Orcs in Mordor. 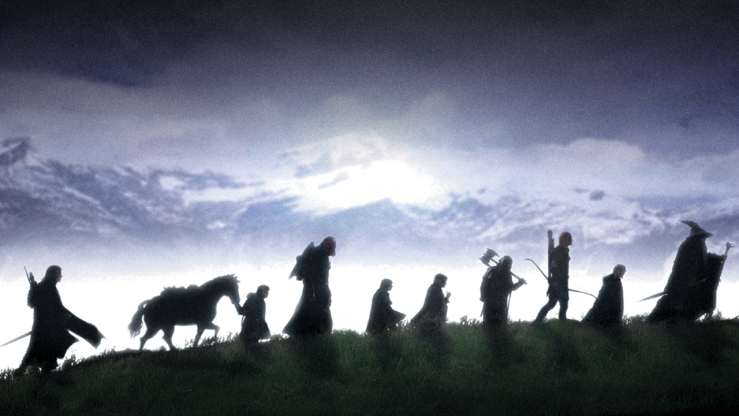 In his stead, the nine Nagzûl are sent to track down the ring. These were nine men who succumbed to Sauron’s power and obtained immortality as wraiths, doomed to serve his will for eternity. They are highly persistent, drawn to the ring whenever it’s used. Otherwise, the real antagonist of this trilogy is none other than the One Ring itself. Indeed, it’s a true testament to both the writers and the actors in how they can make an inanimate object terrifying. You get a sense of how evil it truly is when it causes the mild-mannered Bilbo to lash out at Gandalf and later Frodo. Even Gandalf knows he is not immune to the ring’s tempting power, which is why he requests Frodo specifically to destroy it once and for all. What I feel is the film’s greatest strength is that it’s fast-paced and knows how to make every second count. Granted, a lot of this could be the result of compressing a lot of story into a three-hour-long film. Even with a long run time, quite a few elements had to be excised, glossed over, or otherwise abridged, but the important thing is that Mr. Jackson and his team knew what to keep. As such, no scene lingers on for any longer than necessary, and while one could argue it doesn’t give the experience a chance to settle, I think the individual moments do a wonderful job building off of one another. While some may consider three hours to be a long sit, The Fellowship of the Ring is the kind of film in which most people wouldn’t even notice how much time has passed. The Fellowship of the Ring is a somewhat difficult film to parse. This is because, just like the source material, it comes across less as a standalone film and more of the first act for a larger story. When the credits roll, the plot isn’t resolved at all. In fact, you get a sense that things have only just gotten started. As such, to properly assess The Fellowship of the Ring is to judge it on the merits of being a solid first act for The Lord of the Rings as a whole. Insofar that The Fellowship of the Ring doubtlessly left everyone who watched it back in 2001 eager for more, it was a complete success. It’s the perfect film to see if you’re unfamiliar with the high fantasy genre and want a crash course on what it entails. Then again, it’s also the perfect film to see even if you are familiar with the genre. 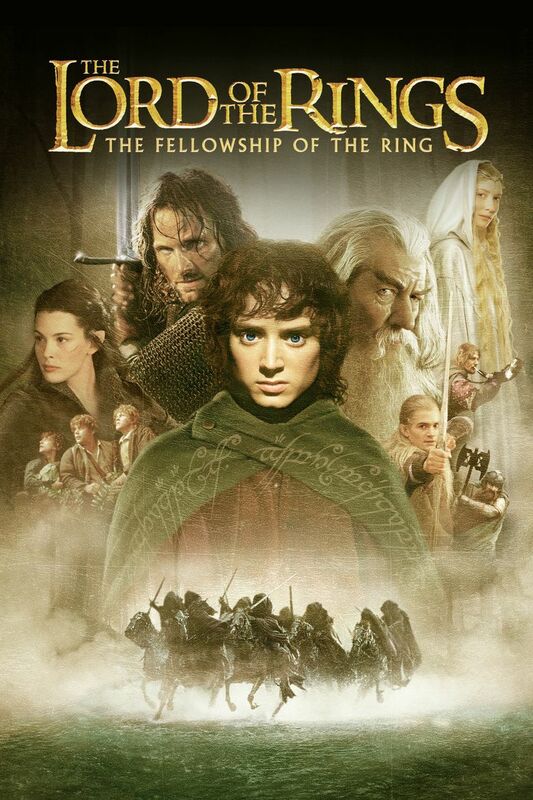 Mr. Jackson was quite brave to take on this project, and with The Fellowship of the Ring, he proved more than capable of translating J. R. R. Tolkien elaborate vision to the silver screen. Probably may favorite movie trilogy. I don’t think I’d change a thing about it. I usually watch the extended editions, and don’t mind the length one bit. I even like the Hobbit trilogy, even if it’s nowhere near what the LotR trilogy is. Peter Jackson did a terrific job at bringing Tolkien’s seemingly untranslatable world to the big screen. One of my top 10 all-time favorites for sure (it’s one instance where I feel tying all three doesn’t feel like a cop-out). I can definitely see why you’d say that. There really aren’t many other trilogies out there that are this consistently good throughout.There’s not a single weak installment or weak moment to be had. I myself decided to review them as separate films despite being one continuous narrative, but I can understand why you’d consider it one giant film because it kind of is. This is merely the first act of a larger story, and I can imagine it left people wanting more when they saw it back then. It’s so good! This trilogy also sparked my love of mythologies (both past mythologies of the real world and personal fictions such as Tolkien’s). I usually watch them all during December, so maybe I’ll review them soon. I plan on reviewing each individual installment, but if I ever get around to making my list of favorite movies, I’m-a cheat and rank them all as one entry. Still one of my favorite movies of all time! The unspoken, escalating horror of Moria is perhaps one of my favorite scenes in all of film! I still get shivers seeing the light from between the pillars as the Balrog closes in. These are indeed great films. When I saw the Mines of Moria, my first thought was “let’s hope those dead bodies *stay* dead”. The Balrog scene was something else, alright. I think that’s what’s so great about The Fellowship of the Ring, this is essentially just the first act of the story, and it only gets better from there. I have to be honest even though on a technical level these are stunning films I couldn’t watch them again. I even found the three-hour theatrical cuts a bit of a slog to sit through first time round, but I would defend their importance in the development of modern cinematic techniques and production. Sorry, but I cannot agree with that assessment. In fact, what I found fascinating about these films is how quickly time seemed to pass when watching them. I remember watching Marketa Lazarová and I thought that was a complete slog to get through despite both films being roughly the same length. I never had that problem with The Fellowship of the Ring because it was A) comprehensible and B) paced remarkably well. I recall this coming out around the same time as the Star Wars prequels and The Lord of the Rings totally ate Lucas’ lunch. Mainly, there was just so much more soul and life in this trilogy. I think a lot of it had to do with Jackson utilizing real world tricks like forced perspective rather than green-screening everything like Lucas was doing. Oh yeah, there’s no contest, really. Peter Jackson managed to defeat George Lucas at his own game with this trilogy. And I think those forced perspectives did a fantastic job making everything seem so real than Lucas’s greenscreening approach. Well, that and the stories were better; that helped too. Oh the Lord of the Rings, let me tell you, I have bought the first book and I couldn’t finish it. The way the flow of the story got interrupted by how there had to be one or two paragraphs about the lore of the world for every event and location the story went through it didn’t sit well with me. That is why I’m very intrigued by the movies because even if their lenght seems a little dauting I assume they would still make the story more digestable, with your reviews coming I guess I’ll set aside one of my weekend holidays to at least watch the first one. That said, I SWEAR I saw them on my Netflix page a while ago and added them to my list, now I can’t find them anywhere and it’s kind of irritating me. That’s too bad. I’d say you’re missing out. Try seeing the theatrical cuts; they’re reasonably well-paced. Wow, a lot of people turned down this movie. Bet they regretted that decision, after seeing what a hi the trilogy was. I cannot imagine anyone else playing Gandalf, but it would have been cool to see Patrick Stewart in the role. I saw this movie at the cinema, but have yet to watch the sequels. Not sure why, as the clips I have seen of Golum impressed me. I know, right? It really is amazing how difficult casting turned out to be. Ian McKellen totally owned the role, but I myself kind of wonder how Sean Connery would have done. Too bad we can’t hop between realities, eh? I somehow completely missed out on watching these films back in the early 2000s, and I was thoroughly impressed regardless. Check out the sequels when you can!